Residential sales of sunrooms, screen enclosures and patio enclosures in Hollywood, Fla., for all of 2012 total less than sales there for just the first six months of 2013, said Chris Noe, president of Venetian Builders, Inc., Miami. The firm’s Hollywood sales this year have been boosted by an increase in insulated patio roofs, Noe said. An insulated patio roof from Venetian Builders, Inc., Miami. 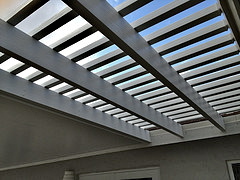 The roof's edge has a pergola look and is all aluminum for low maintenance and long life. Insulated roofs allow homeowners to do two things: shelter themselves from sun and rain, and prevent excessive heat buildup on the patio. In an economy still working hard to recover, homeowners in Hollywood, Fla., have found an economical way to extend their use of patios, said Chris Noe, president of Venetian Builders, Inc., Miami. Venetian designs and installs aluminum sunrooms, patio roofs, patio enclosures and screen pool enclosures in Broward, Palm Beach and Miami-Dade counties, and the Keys in Monroe County. “We hope to extend patio-related sales even more in the second half of the year by offering wooden roofs, for the few areas where aluminum insulated panels are not permitted, and retractable awnings,” Noe said. Insulated roofs allow homeowners to do two things, Noe said: shelter themselves from sun and rain, and prevent excessive heat buildup on the patio. For people who want shade but not a solid cover, Venetian offers aluminum pergolas. “They have the wood look but don’t require wood maintenance,” Noe said. Venetian Builders offers written, detailed, free estimates on solariums and Florida room additions; patio roofs, covers and screening; outdoor rooms; insulated patio enclosures; and screened swimming pool enclosures. Free in-home consultations include a curbside visit from the Venetian mobile showroom. For more information cal 866-596-2427. 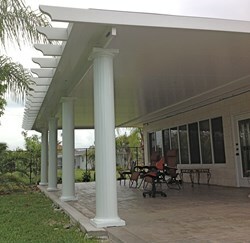 A wood-look aluminum pergola and insulated roof combination installed by Venetian Builders, Inc., Miami. The pergola provides shade but promotes ventilation. Venetian Builders, Inc., Miami, designs and installs aluminum patio roofs, patio rooms, sunrooms and screened pool enclosures in Broward, Palm Beach and Miami-Dade counties, and in the Keys.